You are here: Home / Blog / Keep the knitted items coming! Keep the knitted items coming! Our biggest surprise, at Knit for Peace, is the quantity of knitted items we receive to distribute to those in need. We reckon to have received about 8000 knitted items so far this year; baby hats for the premature baby units at Stoke Mandeville; warm blankets for chilly pensioners; children’s sweaters for street children in India; puppets for school literacy programmes in Nigeria, and loads of children and baby clothes for children in Africa. We also need clothes for children in women’s refuges in the UK (who have had to flee domestic violence, leaving everything behind). We particularly need baby clothes (jackets and jumpers, rather than hats) children’s cardigans and jumpers, long sleeved – ages 1-10. Blankets for grannies; both lap blankets and bed covers, and baby blankets and shawls, and cardigans for older people. Please keep them coming! 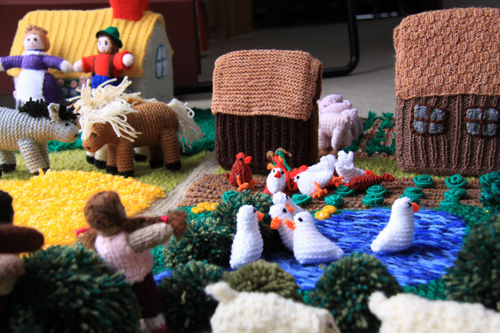 It’s not too late to enter our Knitted Farmyard competition. The prize – a 2 week stay in the Green Hotel in India, our sister project, a palace and historic garden converted into a hotel that gives all its profits to charity and environmental projects in India. We will be at the Alexandra Palace Knitting and Stitching Show – 11th-14th of October. Do come by and say hello. Even better we would welcome volunteers to help us man the stall. We will be selling our specially made knitting accessories (bags, needle cases etc.) and antique silk sarees, all to raise funds for Knit for Peace.